Dacor®, manufacturer of ultra-premium kitchen appliances for more than 50 years, has received the 2016 United Servicers Association Partnership Award for its commitment to providing exceptional service training and technical support to business owners and servicers in the appliance industry. The family-owned manufacturer has been honored every year since the award’s inception in 2013. 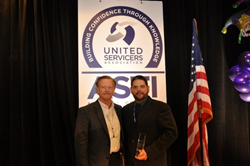 The United Servicers Association (USA) offers training to business owners and appliance servicers, and it grants its Partnership Award to companies that participate in its Annual Service Training Institute (ASTI) and demonstrate outstanding service training and support. Dacor received the Partnership Award in 2013, 2014, 2015 and 2016. In recognition of Dacor’s role as a leader in appliance servicers training, the United Servicers Association invited Dacor President and CEO Chuck Huebner to present the keynote speech to more than 350 servicers and business professionals at the ASTI conference on Feb. 15, 2016. United Servicers Association (USA) is a non-profit trade association for appliance service professionals that provides services and programs that assist members in building strong businesses in North America's competitive environment. Along with conferences such as the Annual Service Training Institute (ASTI), USA provides educational programs, government lobbying, and a variety of management, marketing and operational programs to support professionals in the servicer industry. http://www.unitedservicers.com.